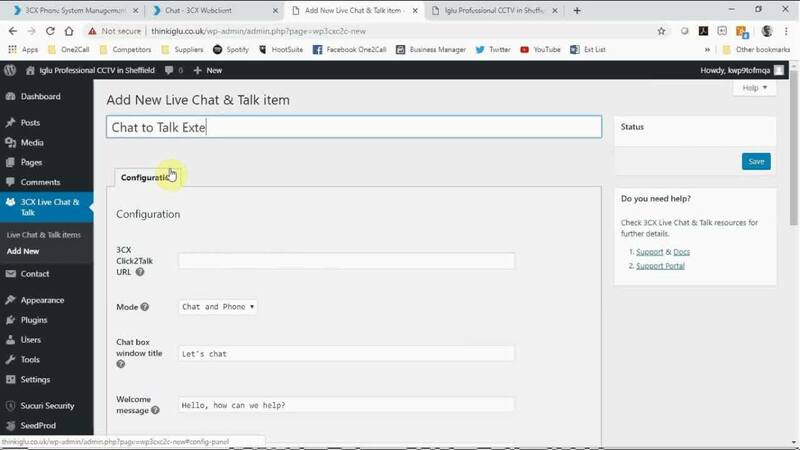 How to add 3CX Chat to Talk to your Wordpress site. 3CX is the software-based communications platform (or PBX in old parlance) that's been taking the business world by storm by bringing advanced features within the range of even the smallest SMEs. It was one of the first platforms to adopt WebRTC, a new web standard that allows voice and video communication to take place direct through the browser removing the need for dedicated apps or applets. 3CX has just released the latest major version release, which includes a super-simple way to upgrade the web chat to allow your agents to elevate a session to either a voice or video call, and at no cost to the customer. The chat widget can be used on any website, but for lucky Wordpress users they've even developed a plugin that makes installation super-simple, as you can see from the short video above. Increases your customers' time on site, which improves your SEO performance. Allows for a more personal on-site customer experience. Allows your customers to call for free (no charge to them or you). Initial chat give agent more info prior to call, getting customer closer to a solution. Visual communication (ie Chat to Video) is shown to be more effective and more engaging, giving a better Customer Experience. Chat can be set up for individual agents or groups. Chat to Talk is available across all 3 license versions (Standard, Pro, Enterprise) making it accessible to all. I hope you find the video useful. As an alternative, here is 3CX's own guide on how to complete this installation. 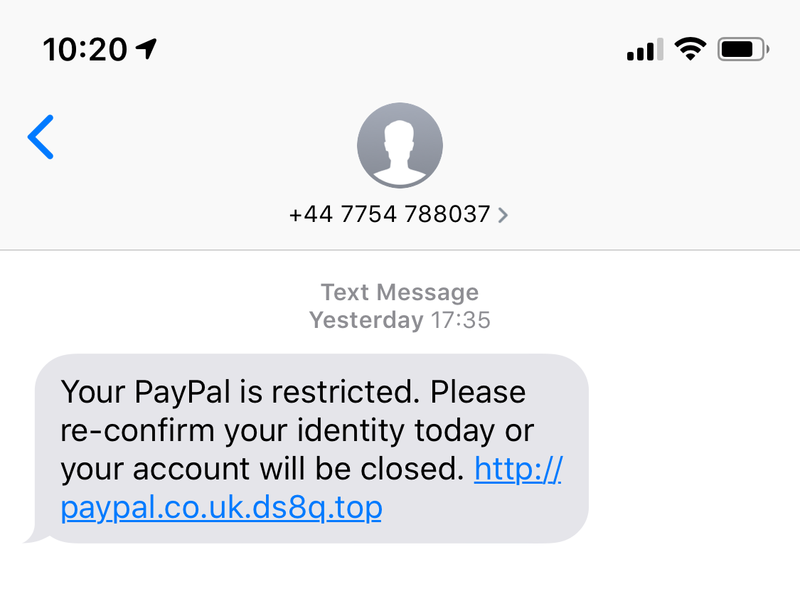 Beware of this "Paypal is restricted" text phishing scam. 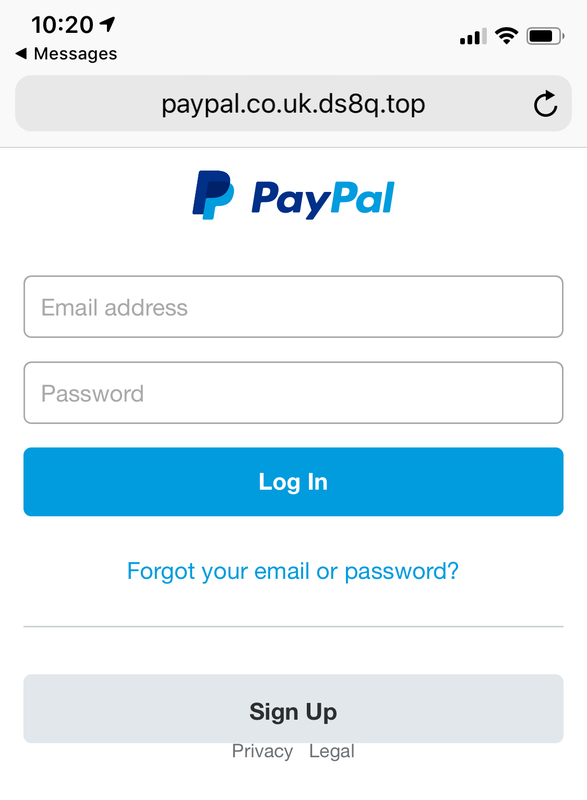 However, this is a phishing scam designed to steal your PayPal user name and password, which can then be used to rack up spending on your account. Phishing is any attempt made to steal your personal data by impersonating a genuine or trusted source. NEVER CLICK THE LINK - JUST LOG IN TO YOUR ACCOUNT. Don't click the link, just log in as normal. You should follow this rule whether the email or text is genuine or not. Reputable companies know that email and text scamming is an issue, so if they want you to take any action on your account, they'll tell you in your dashboard once you log in. Yes, they might send you a reminder as well, and include a link to make it easier to jump straight to the right page, but as scammers get better and better, telling a real from a fake message will get harder and harder. So don't take the risk - don't click the link. How do we know this text is fake? Phishing scammers play on the fact that most people lead busy lives. Most people just scan messages that come in, and if it looks OK at first glance, will click the link. Because of this, they don't always have to look 100% genuine. However, there are usually signs if you take the time to look critically at the message. 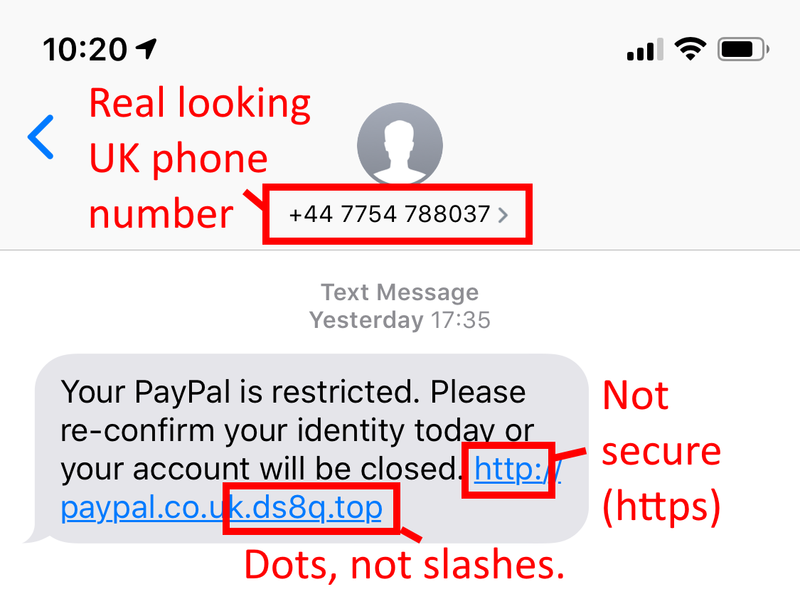 These scammers clearly know that a foreign phone number will automatically attract the attention of a UK recipient, so they've used, or spoofed a UK number. However, any name or number can be spoofed, so who the text appears to have come from should never be taken as proof of authenticity. At first glance, however, this link appears to be from Paypal's genuine UK domain of paypal.co.uk. However, if you look carefully, they aren't slashes after paypal.co.uk, they are dots. What this means in web grammar is that the actual domain name here is ds8q.top and the paypal.co.uk has been created as a subdomain of this domain. Subdomains are always to the left of the main domain, separated by dots. Slashes are always to the right of the main domain (aside from the ones in https://) and indicate different pages or sections of that particular site. If this was a genuine Paypal link it would appear as http://paypal.co.uk/ds8q/top. A bit sloppy this one, but the link isn't to a secure site, so uses http:// instead of https://. Every reputable site that carries your payment details should be using https, and because Google and others are now giving more credibility to sites that carry security certificates regardless of whether they are used for financial transactions or not, pretty much every reputable website should now carry an https prefix. You should be suspicious of any unsolicited link you receive using an http prefix. This attempt at fraud is just one of the many thousands that are bouncing around every day, from simple attempts to steal personal data to attempts to seize and control your vital IT assets for financial gain (or just to be malicious, in some cases). If your business hasn't taken serious steps to mitigate the effects of online criminal activity, it's really important that you do so. Our Security Essentials package starts from just £5 per device, per month and includes business-grade antivirus, anti-malware and real-time threat detection software. If you're now sure what to do or what the costs might be, just get in contact with us and we'll guide you through and find the best options for your setup and budget. Trial 13 services for FREE including Telecoms, IT Support & CCTV. Sheffield-based technology services provider opens up zero-commitment free trials across its' whole product range. It has the ability to make your business operate more smoothly, more quickly, more efficiently, more cheaply and even make your customers and your employees more happy! However, technology is also very complex, diverse and widespread making shopping for new solutions a bit of a brain-ache! Here at One2Call we have some truly amazing technology solutions that can help make your business better, but we're also aware that it can be hard for people to fully understand why our solutions are so great by just looking on our website, or even via a phone call or business meeting. However, once a customer has seen, touched and lived with a new solution, the benefits become very clear, very quickly. That's why we've been working hard over the last few months to enable as many of our services as possible to be trialled simply and easily for free, and with absolutely no obligation to buy. Today we launched free trials across 13 of our services, from off-site backup to CCTV cameras to phone systems to IT support, and we'll be looking to add more to this list as the year rolls on. This is the biggest category of trials at launch, with 5 different solutions available to trial. Horizon is one of the most popular cloud-based voice solutions in the UK, and for good reason. Simple setup, voice quality guarantees, HD handsets and desktop and smartphone apps, all for an easy per-user, per-month price. The perfect solution for small businesses wanting a flexible yet powerful voice solution. 3CX is the award-winning new system in town, taking on the industry big boys by concentrating on constantly developing and improving its software. Contact Centre, video conferencing, call recording & reporting, instant failover and WebRTC, the future of comms technology, can all be had out-of-the-box. The perfect platform for the growing business. Until you can see what's happening with every call that your business fields (or even the ones you miss) you don't have full control over your customer's experience, and we all know how much customer service counts! See what specialist Call Reporting Software can do for your business with our free trial. The ability to record phone calls, whether for staff training or protection, is becoming a must have for many businesses. Our dedicated Call Recording Software can be integrated with your existing telephone system to help give you a greater insight into your business. Once you've trialled using Moneypenny, our recommended professional call answering service, you won't go back! this service is until you try it. So do it! Now! Free Trials on IT Services. Total Care Desktop is our all-in-one bundle of security software, proactive patch management, reporting and real-life support from our own in-house engineers, all at a simple per device, per month fee. Free trial includes a complete company-wide network and security audit. Your servers are the heart of your company, and when it goes awry, your company suffers. Thats' why it makes sense to have it properly managed, protected and secured, night and day. Our 24/7 Total Care Server package does all this, and through out remote monitoring widget, we can even fix issues as soon as they occur, even at night. Protect your most vital company information from damage or theft by ensuring regular copies are made and stored away from your office. Our off-site backup service is simple and easy to configure to backup anything from a single file to a whole drive to a secure off-site location. More than just a cloud-version of Office apps like Word, Excel and Outlook, Office 365 is a whole suite of more than 20 apps designed to improve the efficiency of all areas of your business, from staff rotas to sales presentations. You'll always have the latest software version, and your apps can be installed on up to 5 different devices per user. Cisco Meraki for security and networking. Meraki's cloud-controlled approach to network management make network security and management a whole heap simpler than it used to be. Contact us to set up your trial, and if you're an IT professional, there might even be some free kit in it for you! Modern business WiFi has to do way more than just get you online. It needs to keep your business safe, ensure there's enough bandwidth to go round, offer configurable guest networks and be simple and easy to troubleshoot. That's why you need a proper managed solution, like the one you can now trial with One2Call! If it's been a while since your CCTV network was installed, you may not fully appreciate the improvement that have been made in camera technology. That's why were offering you the chance to try a modern HD camera either with your own existing controller, or remotely from ours. Add new cameras as and when you need them for a simple per-camera fee, and manage the whole system remotely from wherever you are via an easy-to-use smartphone app. It's video security the modern way! Getting your trial started couldn't be easier, just click the button below, complete the form, and we'll be back in touch to set up your trial. Clue: we are not the droids you are looking for! Ever since we released this unusually successful blog about what those green cabinets are that can be found in British streets we keep getting calls from well-meaning members of the public looking to report broken street cabinets to us. Whilst it’s really lovely to receive your calls, when this happens we’re left feeling a bit unhelpful because this is not something we can help you with. These cabinets are maintained by Openreach, a former BT company which is now, theoretically, independent of BT and in charge of the majority of the UK’s telephone and broadband street infrastructure, including the green cabinets. They are the ones that need to know, not us! Regarding green cabinets specifically, they all should have a code number on somewhere (3 letters, 3 numbers or similar), and this would help Openreach greatly if you can give them this info as well. Your voice disaster recovery plan. Build a disaster recovery plan for your voice services to ensure that your customers can always reach you. Your company probably already has a disaster recovery plan (DRP) in place for your IT services. You make sure your data is backed up daily and you have written procedures in place to restore a failed piece of hardware should you ever need to. But what happens when your voice services are disrupted? Any number of events can occur to make your office voice services unusable - from builders accidentally cutting through cables during road works, to an epidemic that results in high staff absenteeism, or even a natural disaster that damages your office. When your staff are unable to answer the phones, business grinds to a halt. Having a proper voice DRP in place ensures that you can keep doing business - and keep your customers happy - no matter what keeps you from opening your office. Creating an effective voice DRP is dependant on you gaining a high level overview of your company and the way your communications are handled. This will ensure that your DRP covers all bases and will enable each department to keep working effectively when a disaster occurs. Which numbers does your company own and where does each of them ring through to when called? How are calls routed after they are initially answered? You might have an IVR that directs calls automatically, a receptionist who directs them manually, or you might drop callers directly into call queues or ring groups. Make a note of how a call flows through each department in your company, from the time the phone rings to the time the call ends. If there are a handful of staff members who handle the majority of the calls in your organisation, write that down. These are the people who need to receive calls the most in the event of a disaster. If they are well trained on how your voice services will change during a disaster, you won’t need to worry about answering “how do I…” questions. Ensure you include contact details for your key telecoms and connectivity suppliers. They will be able to help you implement your recovery plans if necessary. Gain a thorough understanding of how calls are made and received at your company and make sure it is documented in detail. Now that you know how calls are handled by every department, identify any weak points that could cause the communications process to break down. At this stage you don’t need to figure out a solution, you simply need to identify the types of problems that might disrupt your communications. Is there anyone else who can answer calls? Are they correctly trained to do so? Can call forwarding or diverts be activated to direct calls? Staff absenteeism can happen due to ill health, pandemics, extreme weather that can make commuting difficult, or even your own company functions. No matter why absenteeism might occur, you need to ensure you understand the impact it will have on your ability to handle and route calls. call gets routed when your office is closed - be it outside of business hours, a holiday, or because the office is inaccessible for whatever reason - is important to keep your customers happy and, with sales lines in particular, ensure your business can continue to make money. Are your customers aware that your office is closed when they call in? Are they able to reach the right department on their own, or are they directed to a general delivery voicemail system and left feeling like nobody will ever return their call? If the person(s) who normally answer your phones aren’t in the office, make sure there are others available who can take on that role. They should be trained on how calls are routed throughout your organisation, as well as how to correctly operate any telephony equipment involved in the process. IVRs can always answer calls without any human intervention required. Having an IVR will let your customers route their own calls if they cannot be answered by a person. If your company still makes use of traditional analogue or ISDN lines, moving to SIP trunking will provide a large range of voice DRP options. SIP trunking solutions will often allow calls to automatically failover to a secondary office location if your primary office is offline. For companies with a single office location, calls can be diverted to a mobile or any other number to ensure they can still be answered. Alongside SIP, providers are now starting to introduce self-serve call management solutions that allow companies to set up and control how calls are routed to their business. This means that any necessary changes can be made, quickly and easily, via an online portal. The last thing you want to be doing in the event of an emergency is sitting on hold, waiting for your phone provider to make changes for you - some changes to legacy ISDN lines can even take days to be implemented! By choosing a provider who allows you to make these changes yourself, you can get your calls flowing within minutes, using any internet connected device. Most companies have PBX equipment at their office locations that handle call routing, voicemail, IVRs and call queues. If your PBX is unavailable, many of the call routing features that you depend on can be lost if calls are then diverted to another location. This can be confusing and frustrating for customers calling in. A hosted PBX solution removes these features from the on-premise equipment and instead hosts them in the cloud. With a hosted PBX, your customers receive the same call flow no matter what’s happening at your office locations. In addition, most hosted PBX services allow your phones to connect to the service from anywhere - so if you have a disaster, your staff can plug a phone in at home, or access the service via a softphone on their desktop, and keep working. Speak with your phone provider to see what business continuity options are available to you. Once you have identified any required solutions, ensure they are put into place. Lastly, take all of your voice DRP documentation and ensure that the people involved in executing the plan have read and understood it. Make sure a copy of the plan is stored somewhere safe and can be accessed should your office become inaccessible. Document the call flow processes at your company, both for inbound and outbound calls. Identify any gaps that might disrupt your call flow. Include gaps caused by people, processes and technology. Identify and resolve any gaps that you identify - train additional employees, implement SIP trunking, get set up with an inbound call management system or implement whatever new processes and technology necessary to prevent disruption to your voice communications. Document your plan in detail and distribute it to everyone who plays a part in the plan’s execution. Make sure copies of the plan are also stored off-site, so that they can be referenced if your office is inaccessible. Ensuring that you have a full voice DRP will provide your customers with an uninterrupted service, keep them happy and keep you in business. Kids' Christmas Card Design Competition. Christmas could come early for your child this year by winning our Kids’ Christmas Card Design Competition! Get your child to get creative and design us an awesome Christmas card for us to send to our customers and they could win themselves a £50 Amazon gift voucher and a pack of Christmas cards featuring their winning design! Children between the ages of 3 and 11 years old are invited to enter and they must be UK residents. Entries should be A4 sized but can be created in any way you wish. Post a photo of your entry onto our Facebook page (www.facebook.com/One2CallUK) and include your child’s first name, age and where they live (ie town or city, not postal address) and the hashtag #One2CallXmasCardComp. Be sure to Like our page to enable us to notify you win. Post a photo of your entry from your account and include your child’s first name, age and where they live (ie. town or city, not postal address) and the hashtag #One2CallXmasCardComp and mention @One2CallUK. Be sure to follow us on Twitter too so we can DM you if you win. All entries must be received before Saturday 1st December 2018. The winner will be announced via our social media channels. The prize winner will be selected by a panel made up of One2Call Ltd staff. The winners will be selected from all entries received by 1am on Saturday 1st December 2018. Strictly one entry only per child. The competition is open to children aged between 3 and 11 years old on the 1st of December 2018. This competition is not open to any person directly involved in running the competition. To enter the competition, the child must create a Christmas themed image in A4 size which can be saved or photographed and saved as an image file (jpg, png). Parents or guardians must post entries from their own social media accounts and provide the child’s first name and age at time of entry. Entries must not use any image which may breach copyright regulations e.g. cartoon characters, brand names etc. All entries may be published on One2Call’s official social media accounts and website. The closing date for the competition is 1:00am on 1st December 2018 and the winner will be notified as soon as possible after that. One2Call Ltd will contact the winning parent or guardian(s) or guardian(s) using the social media account(s) from which the entry was posted. We will then ask for postal details to which the prizes will be sent. If no reply is forthcoming within 10 days of contact, prizes will not be sent. One2Call’s decision is final. The winning entry will be used for its 2018 digital Christmas card which will be sent by email to its customers. The winning entry may also appear in local press and on the Facebook website. The winner will receive a £50 gift voucher for an online or high street retailer and a pack of Christmas cards featuring the winning design. One2Call Ltd does not accept any responsibility for late/missing entries. Entrants must supply details as required and comply with all rules to be eligible for the prize. One2Call Ltd reserves the right to change or cancel this competition at any stage, if deemed necessary in its opinion, and if circumstances arise outside of its control. One2Call Ltd reserves the right to use, edit or adapt the drawings submitted. One2Call Ltd may use such content in its marketing of One2Call Ltd. Entrants will be deemed to have accepted these rules and to agree to be bound by them when entering this competition. These rules are governed by the laws of England and Wales. This competition is administered by One2Call Ltd. The winner must be aged between 3 and 11 years old on the 1st of December 2018. The winner will not be entitled to any copyright of their submission. No cash alternative is available. The parent or guardian(s) or guardian(s) of the prize winner may be asked to provide proof of identification prior to the prize being awarded. Beware and prepare: weather the seasonal business threats. Unified communications providers can ensure that your company’s telephony and IT systems survive storms and other seasonal disasters. That’s before considering the impact of heavy snow or storms on employee attendance, with the UK typically experiencing 33 snow days each year. The recent flooding across the UK has also given us all a reality check on our vulnerability. It is critical to have a robust phone system in place, courtesy of a cloud-connected unified communications provider, allowing your business to maintain full productivity in the event of any unforeseen disruptions. Rather than relying on fixed phone lines, which can become damaged or disconnected by storms, a modern phone systems move fixed and mobile telephony to the cloud. Hosted phone systems can be cheaper and for small businesses than large-scale PBX systems. in response to changing demands. One sure-fire way to maximise business continuity is to appoint a unified communications provider - a specialist organisation that can handle all aspects of your business phone systems. A cloud-based phone system package minimises downtime because any problem will be resolved by one company, avoiding the nightmare scenario where line and network providers blame each other for a fault, rather than facilitating repairs. themselves with the web portal interface of a hosted phone system. 4 Key Features of Avaya's new Call Reporting software. "Call Reporting"is the official name of Avaya's officially "new" Call Reporting software for Avaya IP Office. In reality it is a rebadged version of Xima Chronicall which has been further developed to ensure seamless integration with IP Office, for which it is destined. 1. Cradle to Grave reporting. This is Avaya's vaguely macabre name for it's main reporting view, and refers to the fact that with their simple interface it's really easy to see the full life of any call, from receipt (cradle) to exit (grave), at a single click. It's an odd name, but the Xima programmers have done a really great job of compressing maximum information into a single screen. In addition to simple symbols which help you to see when a call has been received, placed on hold, answered by an auto attendant, rung or been answered etc... you can also see calls that have been recorded (if you have the recording add on) and play them from within the same interface. This will be a Godsend for many managers who are used to the frustrations of other solutions which make you dot about between screens and programs to perform many of these functions. We also highlight in the video a couple of simple features to make life easier, such as up to x2 speed playback and expiring share links to ensure customer data stays in one place, an especially useful tool for your dtaa processing officer! Like the rest of Call Reporting, it's simple, and it works. Agent Timeline is a lovely and simple new live overview of everything that's happening within your team at the current moment. Each agent is displayed down the left side and on the right a colour-coded bar ticks across in real time to show who is logged in, on do not disturb, ringing or calling both now and over the previous couple of minutes. By hovering over the coloured bars extra info like caller id, call time and call group are displayed. It's the perfect way for managers to monitor their teams when they are in or out of the office, and is much better than relying on less graphical tables or wallboards. Wallboards are essential for any customer contact centre, but it's been the weakness in many older call reporting solutions that it can be fairly difficult to get them looking the way you want, and displaying the info you want. In Avaya Call Reporting though it couldn't be easier with a really simple graphical user interface allowing you to alter just about everything, from backgrounds and logos to tables, pie charts and widgets. Another feature that can either be complex, or expensive, in other solutions has a simple interface built-in to Call Reporting; agent scoring. This module gives you a huge amount of control over your quality assurance checks, allowing you to set which users or groups are monitored, which calls, over which period, and even how many calls you wish to check, either by number or percentage. You can then set up your own QA questions to load within the interface to share with your supervisors. It's then really simple to set the campaign to play and work your way through your qualirt dip check, generating those all important quality performance stats as you go. It's a lovely simple and streamlined interface which will speed up a contact centre supervisor's job greatly, and is well worth a look for any customer-facing team running IP Office. What's more there's no additional licensing just to add user or supervisor logins; its unlimited for both! Avaya intends Call Reporting to replace it's previous call reporting software Customer Call Reporter, or CCR, and they are even offering price support to help CCR customers upgrade to IP Office R11, which will be needed to enable the new Call Reporting software. Just fill in your details below and let us know if there's anything specific you want to look at, and we'll set you up with a demo environment just like the one we used in this demo video. Your details will only be used to contact you with regards to setting up your demo session and will not be added to any mailing lists. There’s a good reason cloud communications is a buzzword among businesses. By tossing their premise-based phone systems, companies are discovering new, streamlined methods of communication, while reducing a number of risks. Maintenance and support costs can quickly outstrip your initial capital outlay for an on premise PBX (private branch exchange). And as your equipment ages, 1 prices only soar higher. Walk away from on-premise hardware sooner - not later. When communication infrastructure is down because of updates, repairs, or natural disasters, your bottom line suffers. With a cloud approach, vital communications capabilities work independently from local power, network, or systems availability. This means even if a fire, flood, or storm makes your office 2 inaccessible, you can still work from any Internet connection or mobile device. features you use or move to a new provider. It can be hard to make certain you’re making the right technology move at the right time. With cloud communications, your service provider, not you, assumes that risk. They’re responsible for acquisitions, upgrades, and capabilities that 5 keep pace with the market. for a predictable monthly fee. Let costly infrastructure investments be a thing of the past. Omnichannel – the new buzz word you should take seriously. Modern customers expect to contact you on the channel they prefer, whether that's voice, chat, social, email or sms. To manage these channels effectively and efficiently, you need an Omnichannel platform. Can your customers reach you in the way they choose? Are your customer interactions driving your business, boosting sales, customer satisfaction, loyalty and advocacy? Or are they costing your business? The customer experience you deliver determines that answer. Customers want fast, accurate answers, and flexibility in the channels they use to contact you. But enabling multiple channels isn't enough, especially if each channel is siloed. Few things are more frustrating to a customer than providing information on one channel only to be required to provide it again on another channel just because your systems aren't integrated! Omnichannel platforms, like Avaya Contact Solutions for IP Office, enable blended, multi-channel capabilities that support great customer experiences to increase revenue and customer lifetime value while improving agent efficiency to reduce costs. Customers can contact you any way they prefer; voice, chat, email or text. Agents and customers can move seamlessly from channel to channel without having to reenter data. That means accurate answers, faster. Powerful, flexible, and easy to use and manage, Omnichannel platforms provide innovative, big business features and capabilities to small and midsize customers and budgets. Create exceptional customer experiences one great interaction at a time with an Omnichannel platform, like Avaya Contact Centre Solutions for IP Office.